Police raid book publishing offices of Yediot Aharonot to find material which, according to suspicions, was transferred by ex-PM Olmert. Police raided this morning the book publishing offices of newspaper Yediot Aharonot in order to find material which, according to suspicions, was given to the publishing house by former Prime Minister Ehud Olmert. The raid received the approval of the Attorney General. Last month, Olmert’s Attorney Hanina Barandes was caught trying to smuggle documents suspected to be classified from Olmert’s jail cell. Barandes was detained for investigation after being caught. The documents themselves were confiscated by prison authorities, placed in a closed envelope and transferred to security officials for investigation. Following the incident, the former Prime Minister was punished with a cancellation of his rights to receive visits, breaks, and telephone calls until further notice. 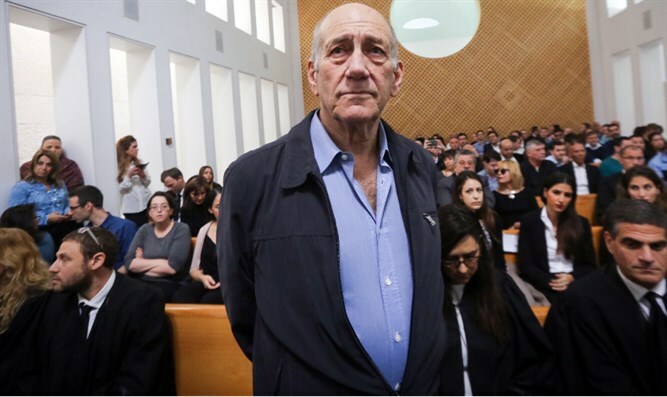 Olmert was convicted of receiving bribes, breach of trust and obstruction of justice in connection to the Holyland and Talansky affairs. He was sent to jail in February 2016 for 19 months.